There may have been a recession on, but the high number of cruise ships visits to Dunedin, New Zealand, is holding steady, according to the Otago Daily Times. Dunedin's tourism chief is pretty happy with the number of visits to the port. The story points to the cancellation of cruises earlier this year by Celebrity Cruises including 11 visits to Dunedin by the 2000-passenger vessel Millennium. But even with that cruise line out of the picture, visits have held at 53 so far. If you're searching for great deals on New Zealand cruises head to cruisesalefinder.co.nz. The Otago Daily Times story (read it here) also quotes Tourism Dunedin chief executive Hamish Saxton -- "I think things are looking better than people were potentially expecting" -- and he adds that the number of cruise-ship visits may be down compared with last season, but the size and passenger capacity of the vessels was increasing. "Last season, Dunedin, with 88,380 cruise ship visitors, was the second most visited port after Auckland (112,870), but ahead of Tauranga (88,109) and Christchurch (87,853)." "The most frequent visitor is Dawn Princess (seven visits), followed by the Rhapsody of the Seas, Dawn Princess, and Sun Princess - all with six visits." Bookings for the 2010-11 season are looking robust, with 58 visits. 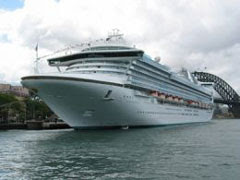 The 2009-10 season begins with the arrival of the Star Princess on October 20 and ends with the departure of the Crystal Symphony on April 5. If you're searching for great deals on cheap cruises NZ go to cruisesalefinder.co.nz.